I have beaten the storm (see previous post) and released the new issue before losing electricity and internet. 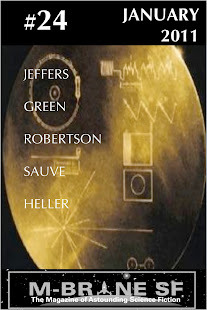 So if disaster strikes, I will at least be able to rest assured that my readers can enjoy fine new fiction by Zachary Jernigan, Alan Baxter, Marshall Payne, Jay Swartzfeger, Janett Grady, Mark West and Garrin Bufo. It's a really fine issue. Oh, are there people reading this who are not subscribers yet? Well, that can be easily remedied by visiting Page 2. Also, one can become a subscriber by other means, too, such as buying one of our books. Purchases of the print and electronic versions of Things We Are Not, Ergosphere (M-Brane 12 Special Edition), and the forthcoming The 12 Burning Wheels by Cesar Torres, all come with complimentary subscriptions to the PDF edition of M-Brane SF. 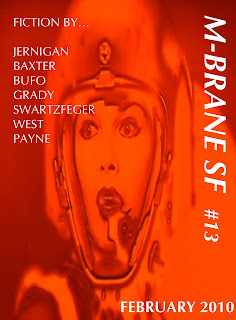 I never did find out where the image for the cover of M-Brane #13 was taken from, so can you tell me? Aaron, I don't have an answer for you yet on a Kindle edition of this one. Some issues have arisen with putting the zine on Kindle, though I may end up with a prc/mobi version that I will distribute directly (same format but without the Kindle rights management). I'll post something on this blog about the ebook situation sometime soon. In the meantime, the PDF version can be gotten from me and the print version is up in my Lulu "store."